PALMDALE, Calif., Sept. 25, 2012 -- Employee-led fundraising activities over a span of just three months at Northrop Grumman's (NYSE:NOC) Palmdale site have netted more than $60,000 for men and women in the U.S. armed services. The site's annual commitment to raise funds for the USO included a popular carnival and car show; bake sales; golf, bowling and tricycle racing competitions; silent auctions; and the sale of USO-branded apparel. "Northrop Grumman employees continually amaze me with their generosity and ability to pull together to make a difference," said Tommy Tomlinson, vice president, Production Operations, and Palmdale site manager. "Anyone can tell how proud we are of our troops by what we've accomplished in just a few months." Representatives from the USO Greater Los Angeles Area chapter accepted a check for the amount raised at a USO care package stuffing event in Palmdale. 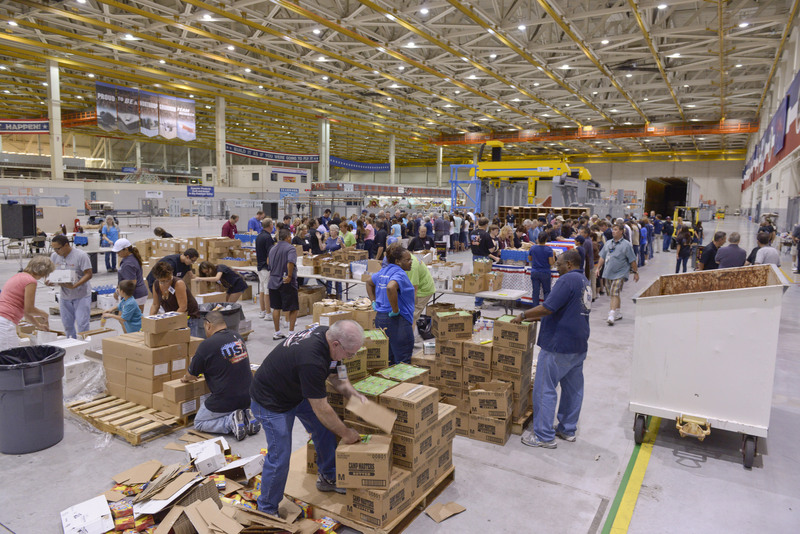 The facility's spacious manufacturing hangar, normally where the Global Hawk unmanned aircraft system and a major subassembly of the F-35 Joint Strike Fighter are built for the military, was converted into a different kind of production line where employees assembled more than 5,000 care packages for service members. The packages consisted of snacks, toiletries, phone cards and reading material. "The USO cannot say 'thank you' enough to the patriotic and generous employees of Northrop Grumman," said Bob Kurkjian, the USO chapter's executive director. "Northrop Grumman's history of giving and its commitment to the community play a major role in our ability to serve over 100,000 troops and their families each year." In addition to nationwide USO fundraising activities, the company sponsors the USO Airport Lounge for military travelers at Washington Dulles International Airport and other airports around the country. Also, in 2010 the company became the title sponsor of the Military Bowl, a post-season college football game in Washington, D.C., that benefits the USO. Northrop Grumman's Palmdale site provides assembly, integration, testing and long-term maintenance capabilities for some of the world's most advanced aircraft, including the F-35, B-2 Spirit and RQ-4 Global Hawk. The site employs more than 3,000 people.